I had an idea of what Niagara Falls would be like in my head. I was both wrong and right. It is international and it is middle America. It is excessively and proudly Canadian. It is a circus, and it is a time capsule of tourism that has remained largely unchanged for about a century. It is the closest I have ever felt to Mother Nature and maybe God, too. It is silly. It is expensive. And it is breathtaking. I'll begin with a breakdown of what we did in about 36 hours—New York Times style, am I right? (Though their version was a little dry, in my opinion.) Then, I'll shout out my recommendations for making the most of you time, from where to stay, what to eat, and who to talk to. 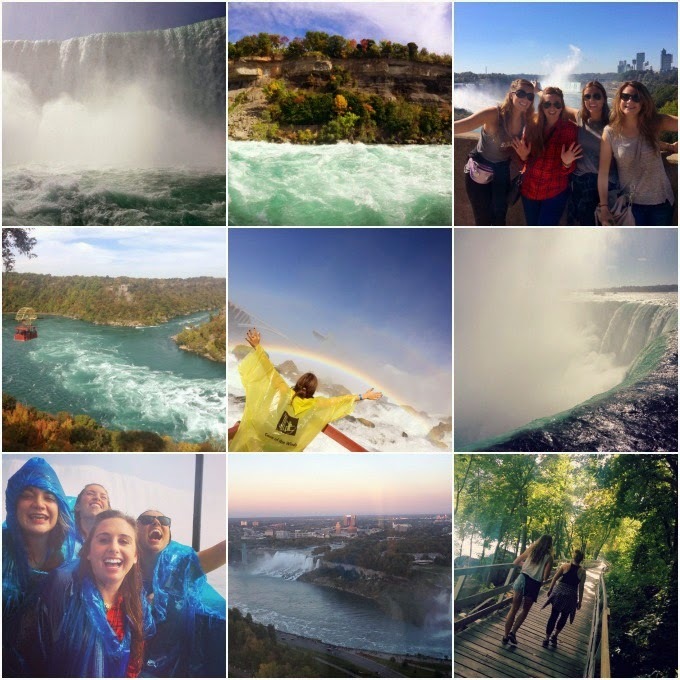 It's a travel diary and a travel guide and sometimes a little gushing. Just go with it. Truth be told, one of our happy accidents was successfully sneaking four girls into a two-person suite. (They charge for more humans, even in a suite clearly designed for more humans.) Through Jetsetter, we booked a 'Junior Presidential Suite' at Embassy Suites. 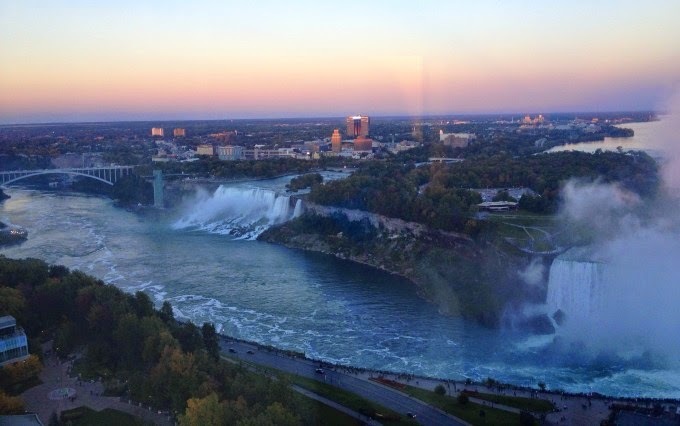 Our room came equipped with a whirlpool bath (big enough for two or four, depending on how fun you are), a little fireplace and most importantly: an unobstructed view of both falls from 36 stories up. With all the lights out, we could just barely make out the rim of the Horseshoe in the night. We had no idea quite what to expect come morning. After an exhaustingly long drive, I awoke in our "fallsview" room not quite clear on where I was or what was going on. Sunlight poured through the floor-to-nearly-ceiling windows and I could hear the rush of the falls. I sat up, rubbed my eyes and walked over to the windows. I gasped. The view was worth every penny, every hour on the road, and every dollar to expedite my passport renewal. Soon enough we were all foreheads-to-glass, pointing, exclaiming and ready to go. Our hotel offers complimentary breakfast in a 9th floor restaurant overlooking the falls, so we joined the masses, hoovered down french toast sticks, bananas, breakfast potatoes and english muffins. All four of us were showered, fed and out the door at 9:45 on a Saturday. 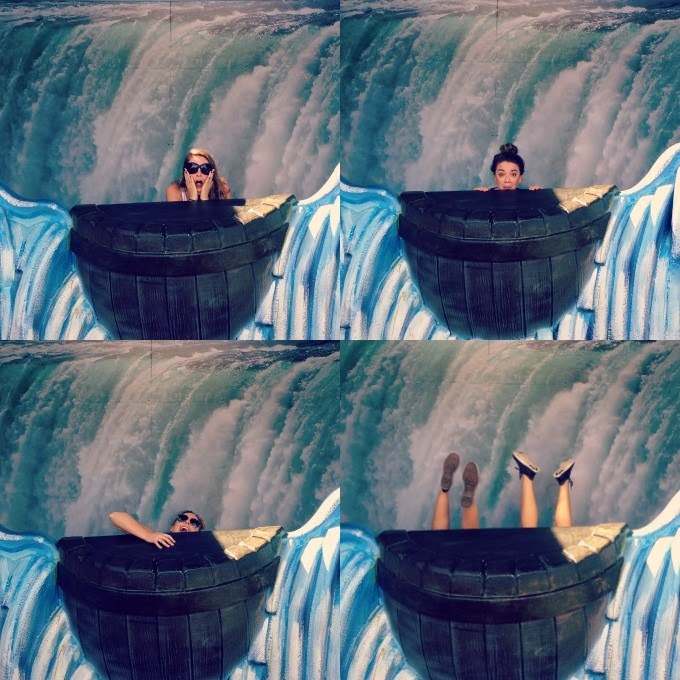 The falls will do this to you. 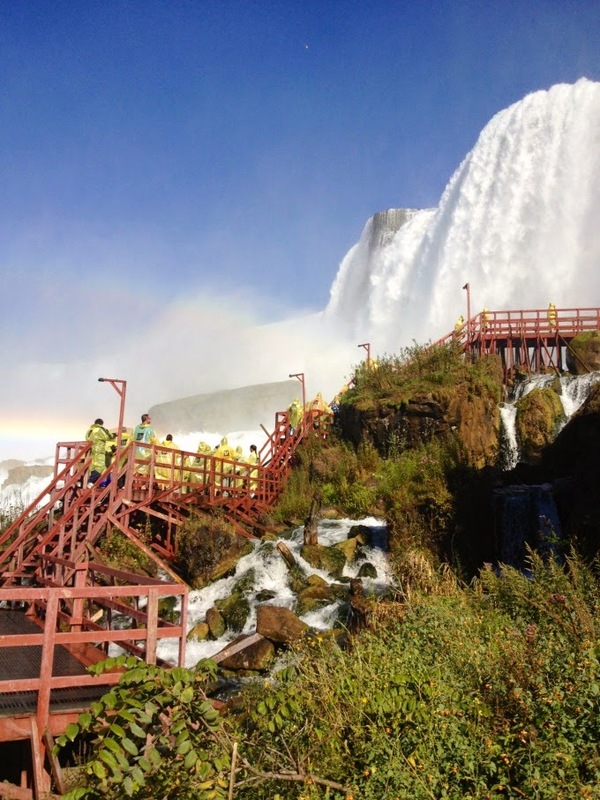 You'd be surprised how long it takes for things to get truly busy at the falls. You can beat the majority of the crowds if you're out and about by 10 a.m. We grabbed coffee at Starbucks (seemingly the only source of caffeine in the whole town, and there's one on every corner) and walked from our hotel down to the scenic pathway. Unlike the rest of the town of Niagara, the path is gorgeously landscaped, minimal and practical. Outcroppings appear at just the right spot and angle for photographs, and its generous width allows you to navigate everyone else's erratic walking rather easily. 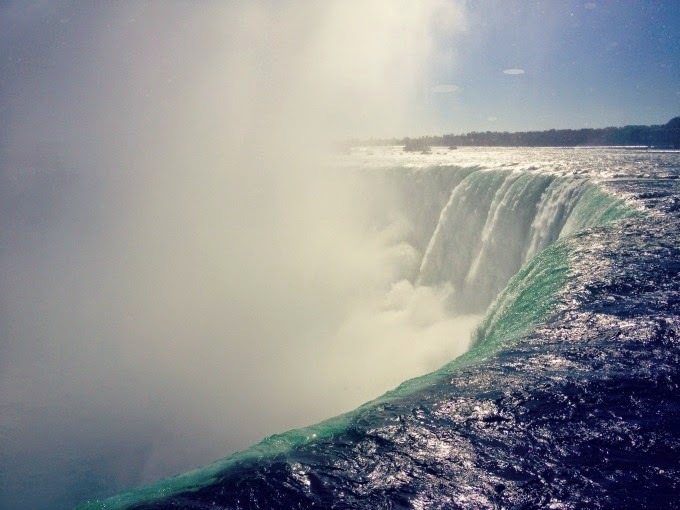 As you approach the edge of the Horseshoe Falls, the mist begins to fall like a light rain. The roar of the water grows more intense and your heart starts to pound. Suddenly you are quite literally face-to-falls with the most incredible force of nature you've ever seen. We squealed, we marveled, said, "Oh my god this is amazing!" at least a dozen times. Then we doubled back along the path past our hotel, with the Horseshoe falls receding, and the American Falls coming into focus. A final visitor's center (of which there are many) provides a picture-perfect view of them before you reach the bridge, and head back to the U.S.A. for all the fun and activities. Once crossed, your cell phone service will return. 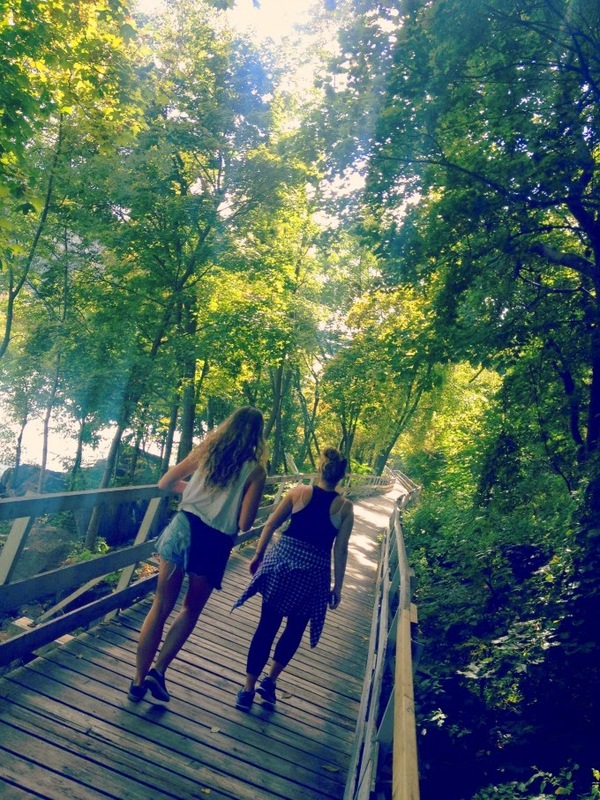 But before you make a sprint to post that first Instagram, slow to a meander and take in the view to your right. I swear, you have never seen anything like it. 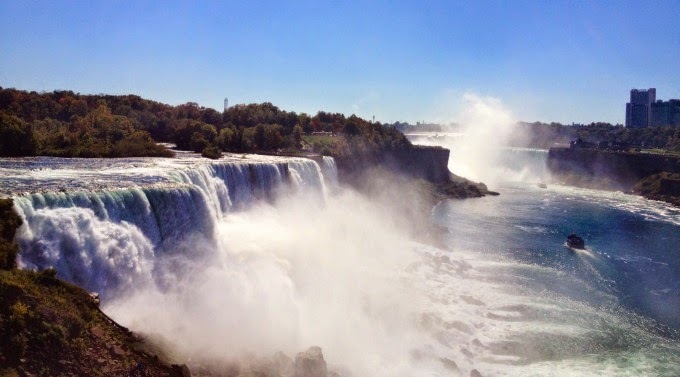 From the Rainbow Bridge that connects Canada and New York, you can absorb both falls from a bit of a distance. Train your eye to ignore the hotels and casinos and take in the nature. From here you can watch the boats touring below the falls, and yes, you can still hear them thundering and roaring. Snap away, it's the photo-op of a lifetime. 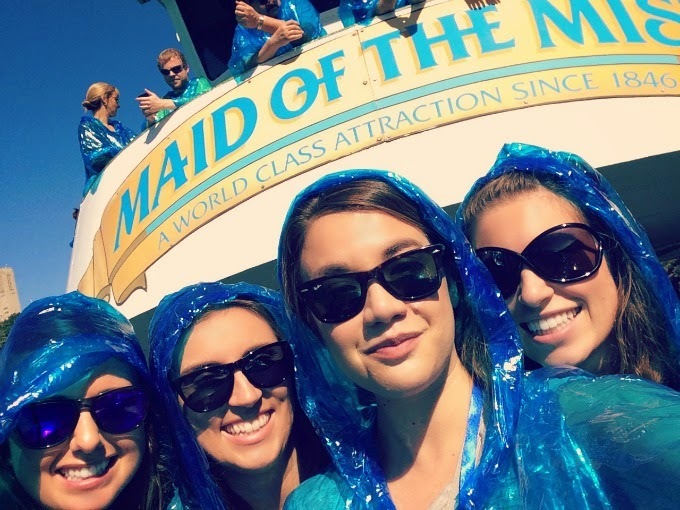 What can be said about Niagara's most famous activity? Each of the four of us agreed that no amount of YouTube videos or photos can prepare you for this experience. 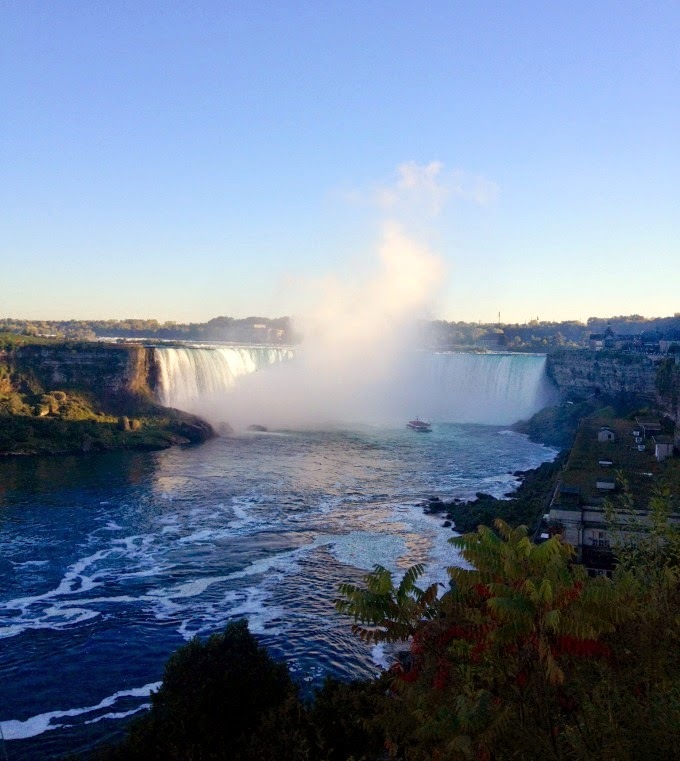 First, to get to the Maid, you must walk out onto a giant platform that extends out over the river, offering a close-up glimpse of the American Falls, and a stomach churning drop to the water below. An elevator ride delivers you to the base of the falls and the dock. You hand over your ticket, grab a poncho and make a break for the line. We beelined for the bow, while most everyone else went for the top deck. From here we had an unobstructed view for the ride. The boat takes you as close as possible to the Horseshoe Falls, where the water below churns violently, and the water above is, well, I don't know how to describe it, really. It's everywhere. It's loud and quiet at the same time. A little bit terrifying, and also peaceful. It was cathartic and joyful and thrilling and hysterical and unlike anything I've ever done before. 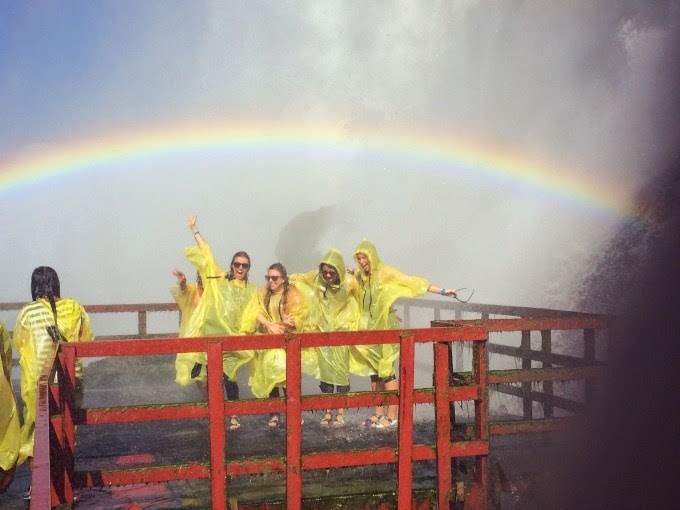 Soaking wet and totally exhilarated, we wound down and dried off on a stroll over to Terrapin point, the jetting edge of the Horseshoe Falls on the American side. It's less misty than the Canadian side and a bit less stunning, but none-the-less, you can get close enough to touch the rushing water if you want. By this point it was abundantly clear that safety is a DIY experience at Niagara, like the parks department put up a fence, suggested not climbing over it, and left everyone to do as they will. We threw wishing pennies over our shoulders instead. We made the walk back across the Rainbow Bridge towards our hotel in the late afternoon, but had to wait in line at the border back to Canada for about 30 minutes. When we finally got home, we were exhausted from our day, and decided to order pizza to our room, drink wine and recount our favorite moments of the day. Without connection to the Internet or our cell service, we happily chatted away, listened to music, popped champagne and got the whirlpool jets going. 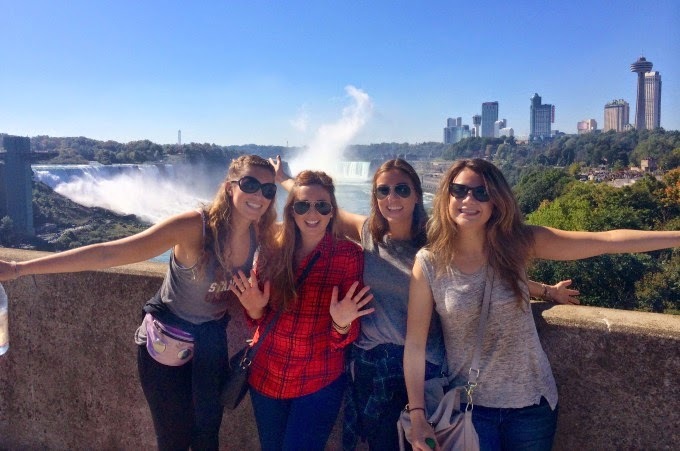 We were all asleep by 11 p.m.
For our last stop on tour de Niagara (also known as #fallzsohard) we drove to the scenic lookout where the Spanish Aero Car takes visitors in a cable car dating back to 1916 across the Niagara gorge and over the famous whirlpool waters. Downriver from the rapids, the river makes an abrupt 90-degree turn (thanks to some kind of massive geological event about 40,000 years ago) and heads for Lake Ontario. All around this area on both the American and Canadian side are miles of hiking trails. We didn't have time to stay and explore, but if I ever return, that will be at the top of my list. Who doesn't want to picnic alongside of some of the most dangerous water in the world? We briefly stopped by the quaint little town of Niagara-on-the-Lake, a lesser-known tourist attraction that still draws hordes of slow-moving oglers. While the scenery is certainly picturesque, the crowds were stifling. We grabbed some ice cream and began our drive home after just about 20 minutes in town. TICKETS: Before we left for Niagara, we each bought a Discovery Pass, which includes tickets to a bunch of attractions on the American side, in hopes to save time upon arrival. Not so. Even if you already bought it, you still have to stand in the line with everyone else who's about to buy their own, just to have yours processed. It's a money-saver, but not a time-saver. JUST. ASK. Need a photo? Need directions? Just ask. At an attraction like this, most people know how to take a photo. Because honestly, they want the same thing. They want faces and waterfalls in the same frame. Everyone we asked was happy to oblige, and we only got a couple finger-over-the-lens shots. Also, the Canadian people who work at the vistor's centers, help desks and kiosks throughout know literally everything. They will send you on your way with all the information, a map with highlighted directions and a smile. Want a recommendation? 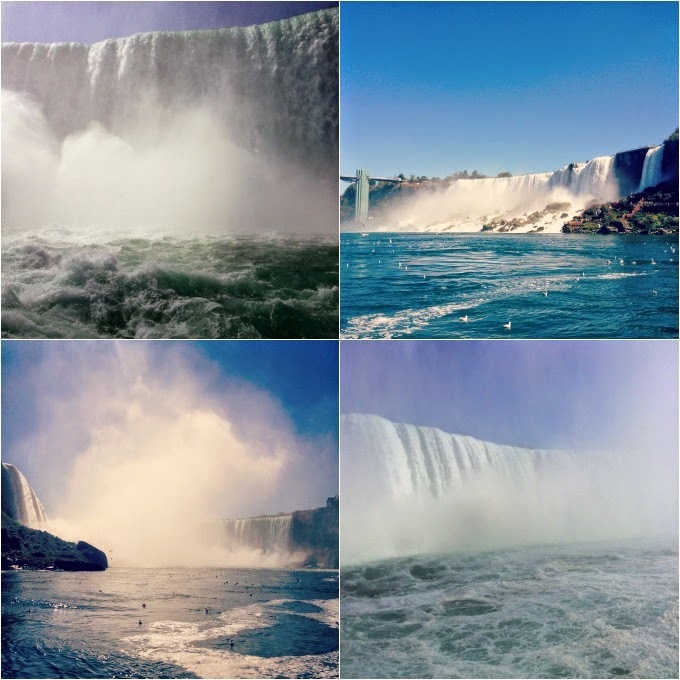 Curious about Niagara facts and figures? Just ask. OH, CANADA! 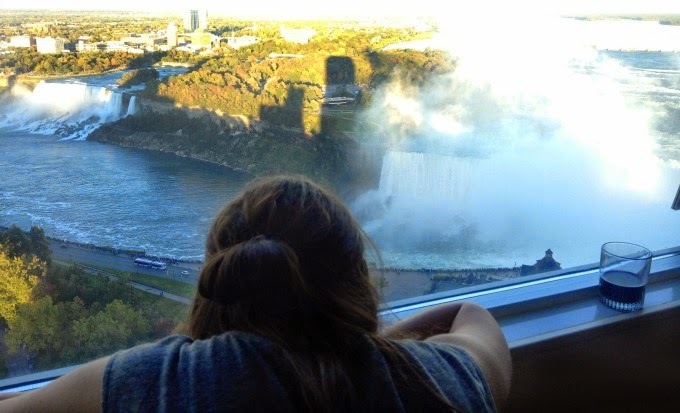 The better hotels and the better views are on the Canadian side. 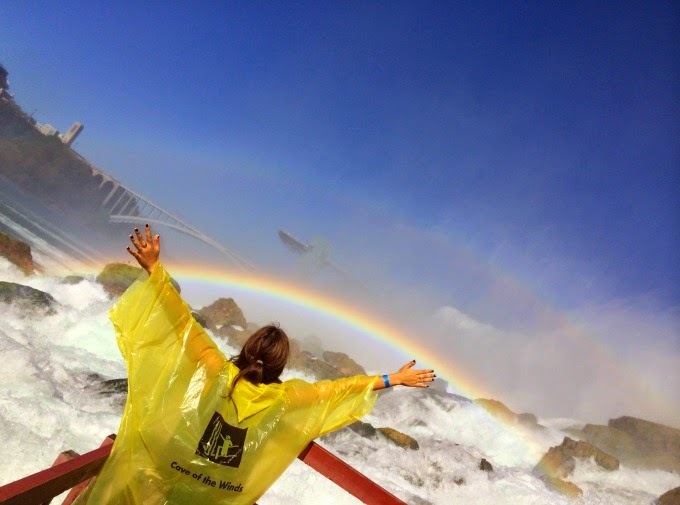 Visit Niagara National Park (with the Maid and the Cave) on our side, but leave it at that. Also, be sure to check out deal sites like Jetsetter and Living Social for bargains on hotel rooms, etc. 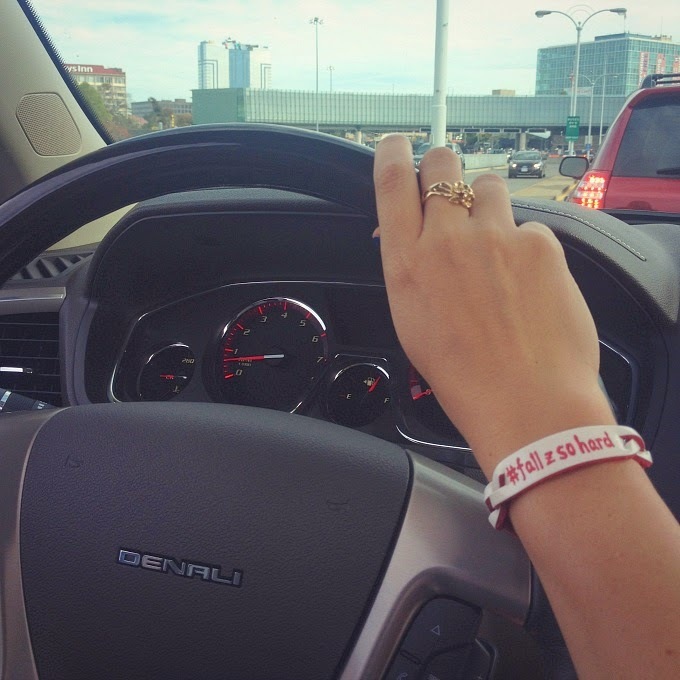 *Our car [a GMC Denali] was generously provided by Drive The District, but did the rest on our own! 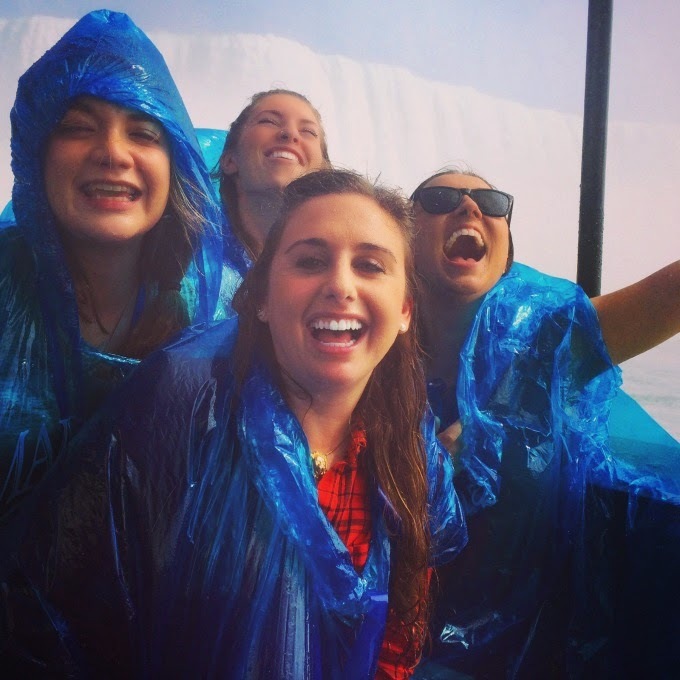 Niagara Falls is so much fun! Looks like you had a great time, nice pics!